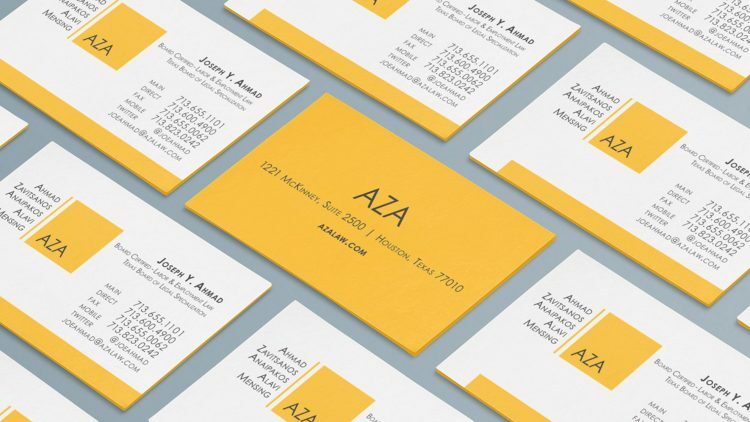 Now that we’ve established that you need an engaging business card, avoid the urge to dig through your files to reprint your layout from 10 years ago. Business cards have evolved to fit their environments. With all the essential information available online, more and more people are including less and less content. All you really need is your name, company, email, phone and URL. The rest can be found with a quick visit to the company website on a smartphone. Depending on your business development strategies, it might also make sense to print social links such as your Twitter handle or LinkedIn profile URL. For example, if much of your client development involves giving speeches, consider adding your YouTube channel on your card to emphasize your public speaking. Just remember not to make the card too busy; white space isn’t necessarily a bad thing. Once the content is selected, it’s time to focus on the design. Remember to keep the overall look and feel of your firm in mind when selecting the layout. For example, the business cards for a venerable century-old East Coast law firm should not look like those of an up-and-coming IP boutique from the Silicone Valley. Also, consider the virtues of double-sided printing: including the firm logo or representative firm image (are you in an iconic building, or is your dog the mascot?) on the back of your card can convey the firm’s personality while leaving enough space for contact information. This technique is a great way to avoid clutter. Make sure you stick with the classics when it comes to selecting paper. While lamination or coating might seem tempting, and would indeed stand out, it’s important to stick with a cardstock that provides a good writing surface so people can take notes. The same idea goes for color or images; for example, reverse type (black background with white text) might seem appealing, but it is impossible for recipients to read their notes. Also, investing in a heavier or thicker cardstock can make a huge difference; it’s not only practical because it will withstand normal wear and tear, but it also connotes reliability and stability – essential qualities in a law firm. A memorable card can be great for business, but it should be memorable for the right reasons. Even though a card shaped like a gavel may be thematically appropriate, all it tells clients and potential clients is “I was going for the gimmick.” Instead, try to stand out with subtle details: engraving, double sided printing or a vertical card can make as much of an impact as gold leaf on parchment. Your business card should be a reflection of you and your company. Include the necessary information, select a clean and consistent design, and make it memorable. Finally, if you’re feeling adrift in a vast ocean of typefaces and printing techniques, contact the experts; the advertising and marketing team at Androvett can help you create a solution that fits nicely on a 3.5″ x 2″ piece of paper.